This brand new Rock climbing wall will attract attention at your next big event. It stands 26' tall and has 4 climbing lanes with the lastest safety technology on the market. The kids need to be at least 42'' tall and weigh 45 pounds to climb the wall. This rock wall isn't just for kids it can easily handle 250 pound adults. 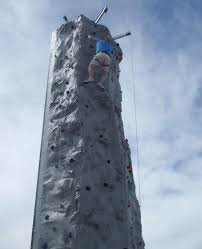 This state of the art Rock wall is designed to be challenging, safe and super fun with 4 different skill levels each station has a different path to climb 1 easy 2 medium and 1 hard lane we can handle most any crowd. Challenge your freinds and lets see who can get to the top first and ring the buzzer. The super safe auto belay system lets you repel down safely constantly keeping you safe from falling. Just let go and be slowly be lowered to the ground. If you want to have an event that everyone will talk about then rent this rock wall for your next big party or event.